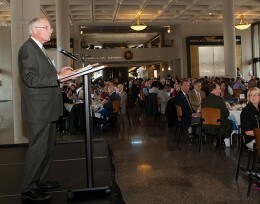 The event was presented by the Greater Dayton Region Chapter of the Association of Fundraising Professionals. Wright State President David R. Hopkins recognized individuals and groups working to make the region a better place during the 23rd annual National Philanthropy Day luncheon on Tuesday, Nov. 13. 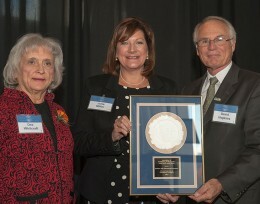 Hopkins presented awards to David and Theresa Gasper, the Western Ohio Educational Foundation and Cox Media Group Ohio. Regis Lekan, Wright State’s executive director of development and gift planning, also received an award presented by Joe Baldasare of the Dayton Foundation. 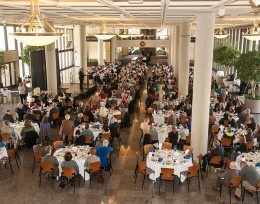 The event was presented by the Greater Dayton Region Chapter of the Association of Fundraising Professionals (AFP). Nationally, the AFP fosters the development and advancement of the fundraising profession, promotes stewardship, donor trust and effective and ethical fundraising to enhance philanthropy. The organization represents more than 30,000 members in 226 chapters throughout the world. 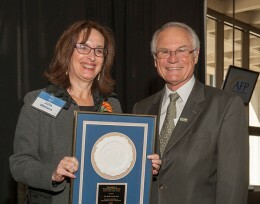 Wright State staff member Regis Lekan was honored as the Outstanding Fundraising Executive. Regis Lekan is currently the executive director of development and gift planning for Wright State University, where his major responsibilities include directing the planned giving function as well as providing leadership for the annual giving program and several major gift officers. Since starting this position in 2010, Lekan has closed 45 gifts with an estimated value of more than $13 million. Prior to joining Wright State, Regis worked at the University of Dayton for more than 20 years. His advancement roles there included gift planning, major gift fundraising and alumni relations. Lekan has earned a certification from the National Planned Giving Institute and has been active in the Partnership for Philanthropic Planning of Greater Dayton, where he has served on the board of directors and as the 2007 president. He has also served as president of the St. Vincent DePaul Society Community board, the Incarnation Parish Council and the Dakota Center Board. He is currently a member of the Dayton Foundation Development Center. Though the Gaspers were unable to attend the awards ceremony, Dr. Hopkins spoke of their generous giving and leadership thoughout the Dayton region. The Gaspers are dedicated to strengthening the Dayton community through the dedication of their time, talent and treasure. They have led several initiatives that have had tremendous impact on a number of local organizations. Theresa is currently working to revitalize the Historic South Park district in ast Dayton. She is one of two investors behind the 2007 RehabRama in South Park, the first ever produced with private funding. She serves on several boards including those of the Wright State University Foundation, RebuildingTogether Dayton, the HomeOwenership Center of Greater Dayton, Habitat for Humanity, and the March of Dimes. Theresa was named one of the Dayton Daily News’ Ten Top Women in 2011. David, a 1978 Wright State graduate, has been active in promoting entrepreneurial activities throughout the Dayton area. His community-minded activities include serving as a member of Ohio’s Third Frontier Advisory Board, volunteer chairman of the Chamber of Commerce’s CEO Development Program and a member of the Greater Dayton IT-Alliance board. In recent years, his efforts as lead fundraising chair for DECA have helped to generate almost $2 million to ensure success for first-generation college students. He is also the executive-in-residence at Wright State’s Raj Soin College of Business, teaching classes and connecting the college to the local business community. David was honored as one of Wright State’s Outstanding Alumni in 2000. President Hopkins presented an award to the Western Ohio Educational Foundation, a group that works to benefit the university's Lake Campus. The Western Ohio Educational Foundation (WOEF) was organized in 1962 in response to a growing desire for residents of Wright State’s Lake Campus region to have access to higher education. For over 50 years, the WOEF Board has remained strongly committed to the success of the Lake Campus through capital, programmatic and scholarship projects. Governed by a 25-member board of community leaders, WOEF actively engages with the Lake Campus region by listening to local business needs and supporting the establishment of new educational programs that directly benefit the region, such as the bachelor’s degree in mechanical engineering. WOEF’s most recent campaign brought in revenues of over $4 million to renovate and add spaces such as James F. Dicke Hall and student housing. For the 2012­–13 academic year, WOEF provided 161 awards to 127 students totaling $267,000 in scholarships. Since its inception, the organization has awarded more than $2.98 million to Lake Campus students. By working with both the university and the community, WOEF’s proactive style and visionary impact are significant drivers in the region’s growth. 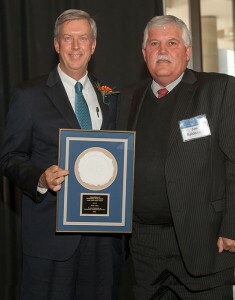 Julia Wallace accepted the Outstanding Large Corporation award on behalf of Cox Media Group Ohio. For more than 100 years, Cox Media Group (CMG) Ohio properties have striven to inform, inspire and entertain audiences. A big part of CMG Ohio’s place in the community is that of a leader in financial and charitable support. All Cox companies are supporters of various nonprofit organizations that impact arts and culture, health and human services, civic and community involvement, education and literacy, as well as diversity and the environment. CMG Ohio supports broad regional programs such as the United Way, Culture Works, the American Cancer Society’s Making Strides Against Breast Cancer, the K99.1FM and Children’s Medical Center Radiothon, WHIO-TV’s support of Children’s Miracle Network Telethon and annual food relief campaigns across numerous area counties. CMG Ohio focuses on area education in a number of ways. Two examples are the teaming of University of Dayton and Wright State students with CMG Ohio for the annual July Clean Sweep activities to clean up the Great Miami River and an active internship program focused on students attending the University of Dayton and Wright State. In addition to the charitable activities of CMG Ohio, the James M. Cox Foundation provides financial support for the greater southwest Ohio region. The Foundation concentrates its charitable giving on several priority areas: conservation and environment, early childhood education, health, and empowering families and individuals for success.